Ex Hot Girl: Apothica Giveaway! I am proud to pass along a fabulous giveaway to you guys. I have been thinking lately about how I do NOT take enough time to take care of myself the way I should. Not just with being active and eating right, but ... all the other ways. Like, skin care and making sure my dry skin in this winter time stays nice and hydrated. Like giving myself pedicures, or doing a hair mask. Lighting some great aromatherapy candles while I read up on the latest diet. Replenishing my OLD makeup stash so I'm not using expired products. Win a $50 gift card to Apothica.com! They have a ridiculously awesome bunch of great stuff to buy. One of my very favorites is the Pre de Provence Lavender Soap. Handmade, natural soaps are my favorites, and Lavender is a naturally calming and relaxing scent. If you're stressed, take a hot shower with this soap and I guarantee after a few deep breaths you're going to feel better and sleep hard. 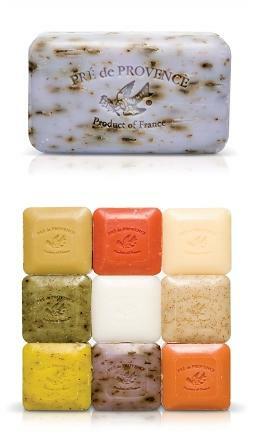 You can check out all the Pre de Provence soaps here. They even have gift boxes with all kinds of soaps, which I actually get for myself because I can't pick. They have green tea soap, pomegranate, mint leaf, I mean, come on! Oh, and hand creams. Okay, I need to go buy some more of this stuff. /delicious. The contest will end on Friday, February 11th, 2011. As usual, there are LOTS of ways to win! Remember, you have to comment here to let me know the steps you did, or I won't know. :) Please do separate comments for each method you use. Thanks!! 3) The contest is open internationally, but Apothica does not ship to all countries. Also, please save SkinCareRx as a contact in your email. I wrote on their facebook wall, opted into their newsletter, tweeted about them on my twitter account and went to retweet the contest, but couldn't find yours, just some other giveaways. Would you like us to do separate entries?? I did Option 1 & Option 2! ***Thanks for sharing this amazing deal!!! hi I am a new follower. What a great giveaway! I did option 1. I had never heard of them before, but I'm glad I have now! I did the facebook option! I also chose the twitter option! Also did the bonus twitter entry! Bonus Entry: Retweeted Apothica’s tweet about this giveaway. I entered by writing on Apothica's Facebook wall.